Sunskey 4 ports AV switch allows you to connect multiple video devices with AV out (such as XBOX, DVD, PS2, Cable Box) to one set of AV device using AV cables. Then you are able to switch the input signal without unplug and plug your AV devices easily. It's widely used in DVD / VCD / VCR, TV special kind of game players. Convenient switched with the button on front panel. So it can be used in your home, office, restaurant, shopping plaza, hotel, factory, etc. If you have any concerns, feel free to contact us. We are pleasure to serve you all the time. 4 input 1 output or 1 input 4 output audio selector box, switch between AV sources with button on front panel. No need to plug and unplug. Have strong insulation and anti-jamming. No signal distortion and no timbre loss. No extra power supply and software drive needed. Easy install, just plug and play. Made of durable metal housing, makes it excellent stability and longevity. 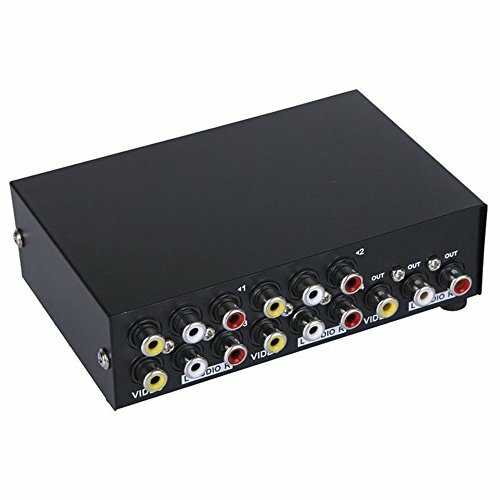 Works with DVD, VCD, TV game, VCR station selector, satellite TV, etc. It's widely used in security or education and so on. If you have any questions about this product by Sunskey, contact us by completing and submitting the form below. If you are looking for a specif part number, please include it with your message.